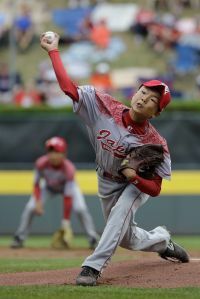 Kabu KikuchiJapan's Kabu Kikuchi pitches during the first inning of an International double elimination baseball game against Venezuela at the Little League World Series tournament, Wednesday, Aug. 26, 2015, in South Williamsport, Pa.
Tokyo got down to its final strike before tying it in the bottom of the sixth inning with a single, then rallied again to overcame a two-run deficit in the eighth for a 5-4 victory over Venezuela on Wednesday and a berth in the International bracket title game at the Little League World Series. The team from Barquisimeto will play Mexicali Baja California, Mexico, on Thursday. The winner of that game faces Tokyo on Saturday for the International championship and a chance to play the U.S. winner a day later for the World Series title. Shingo Tomita tied it 2-2 with a two-out, RBI single on a 2-2 pitch in the sixth. Barquisimeto hit back-to-back homers in the top of the eighth, but Tokyo pulled it out with a pair of doubles, a single, an intentional walk and Yugo Aoki’s bases-loaded single with one out.